Post-apocalyptic settings seem to be the bread and butter of action/adventure-based games these days. It could be that it's a product of the ambiguous times we live in, but games makers seem to be a little bit obsessed with the End of the World as We Know it. Seldom has there been so literal an embodiment of that mentality as in Darksiders, however. The Apocalypse has happened. We're not talking the nuclear kind, or the alien attack kind or the swine flu kind. We're talking the full-on, biblical four horsemen kind. That's your REAL Apocalypse. Thing is, it's come a bit off schedule. Read: early. War (the horseman) was found at the scene and he's taking the blame for it. Determined to get to the bottom of it all, off he trots to drill down through all the mystery and get to The Truth. When you're War, however, it's not about asking questions and putting the clues together, it's about messing people up with your Great Big Sword. On top of all that there's plenty to explore, with huge great sprawling levels littered with physics-based puzzles to bend your head around. This Warmastered Edition also brings with it overhauled graphics, bringing this action RPG into the current generation. So, what's War good for? 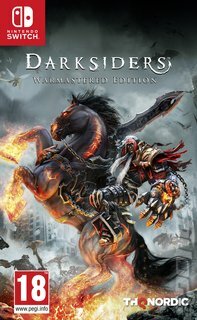 Darksiders, that's what.